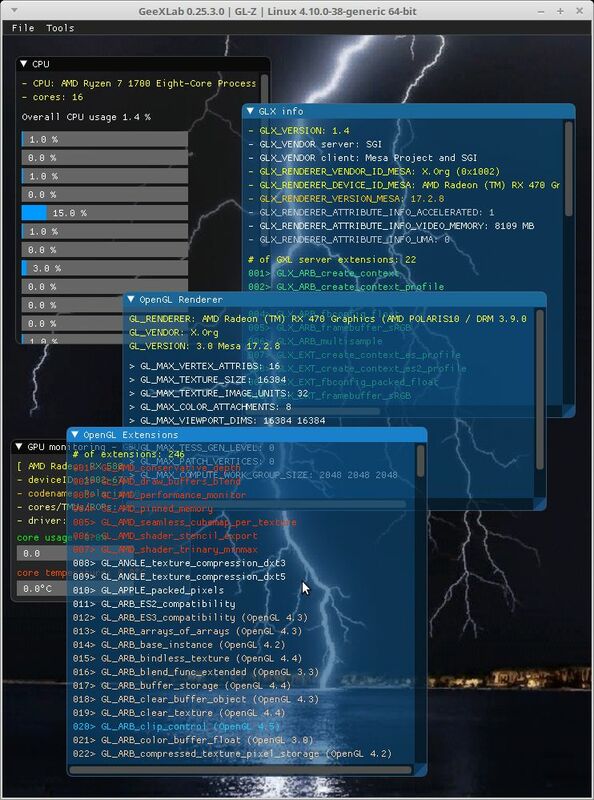 The version of GL-Z has been released for Windows, Linux, macOS, Raspberry Pi and Tinker Board. I have ubuntu server with xfce desktop. ^^^ Then back to command prompt. 23:32:01(0000006) [info ] GeeXLab is launched with admin (root) rights. 23:32:01(0000007) [info ] [SQLite3] SQLite3 version 3.22.0 - initialization ok.
23:32:01(0000008) [info ] GraphX Core 0.29.14.0 (codename: Hawking) initialization ok.
23:32:01(0000017) [info ] Command line: ./GLZ /demofile="./glz_src/main_gl45.xml"
23:32:01(0000020) [info ] OpenCL support not found: unable to load the OpenCL core library (libOpenCL.so). 23:32:01(0000027) [info ] [GpuMonitor] initialization ok.
23:32:01(0000030) [info ] Command line: ./GLZ /demofile="./glz_src/main_gl45.xml"
23:32:01(0000035) [info ] [Lua] LuaFileSystem initialized ok.
23:32:01(0000036) [info ] [Lua] LuaSocket core initialized ok.
23:32:01(0000037) [info ] [Lua] Mime core initialized ok.
23:32:01(0000038) [info ] [Lua] LuaSQL SQLite3 driver initialized ok.
23:32:01(0000039) [info ] [Lua] LuaGL initialized ok.
23:32:01(0000040) [info ] [Lua] initialization ok. I only tested on Linux with a NVIDIA GeForce card. So I'm not surprised that it doesn't work with a Radeon card. Initializing a GLX context is always delicate... I will look at the issue asap. 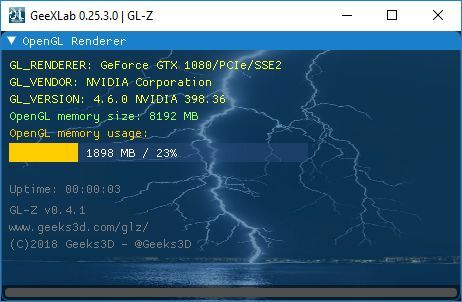 A new version of GL-Z is ready for Windows and Linux platforms. 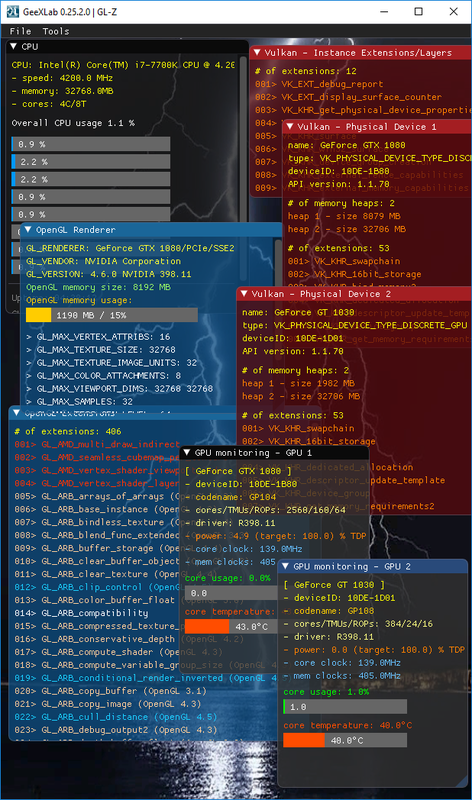 - added option to start GL-Z in OpenGL memory usage monitoring only. - fixed AMD Radeon support on Linux platform with Mesa driver.